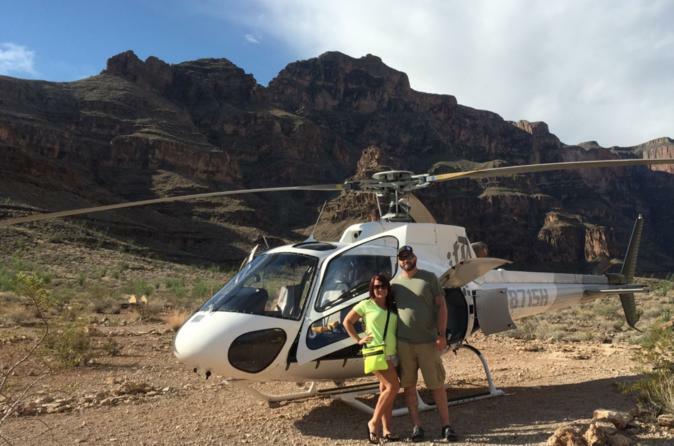 Experience the best views of the Grand Canyon on a 90-minute helicopter flight with champagne landing and shoot a wide range of guns on this adrenaline filled day tour from Las Vegas. An all-American hamburger lunch, all necessary equipment and hotel pickup and drop-off are included. This tour can be combined with a 3-hour ATV tour through the Lake Mead Recreation Area for a full day outdoor adventure. After an early morning pickup from your Las Vegas hotel, you will be transferred to Boulder City to board a luxury helicopter for a flight through the Grand Canyon. Have your camera ready as you see aerial views of the Hoover Dam, Lake Mead and Colorado River before arriving at the canyon. Before you descend below the canyon's rim, you'll take in panoramic, 180-degree views of the magnificent scenery below. Marvel at the towering cliffs and stunning multi-colored walls sculpted over 100 million years before descending 1,500-feet below the rim. Then land 4,000 feet at the bottom of the canyon for a picnic and champagne toast. As you circle back, take in your last views of the Colorado River and Quartermaster Canyons before landing back at the heliport. Following your flight, you'll then take part in the shooting package of your choice. After meeting your instructor and participating in a safety orientation, you will head to the outdoor range. With a wide selection of .50 Cal selections including the Barrett Sniper Rifle, Browning BMG and Desert Eagle, you will be able to find the package to fit your interests. Please see the Itinerary section below for available packages. After shooting, enjoy an all-American lunch at the onsite restaurant complete with a fresh made hamburger, french fries and soft drink. You can upgrade your experience at the time of booking to include a 3-hour ATV tour through the Lake Mead Recreation Area for a full day of sightseeing! Please see below for more information on these options.